It’s nice to support the ones you love, you know? Build up their accomplishments, brag on them a little, maybe even, you know, exaggerate just a tad. But hey, Breitbart: That’s not a rally for your candidate of choice Donald Trump. That’s a parade for some basketball. Talking Points Memo notes that Breitbart, which really really loves Trump, wrote a breathless story congratulating Trump on his big rally in Jacksonville, Florida. 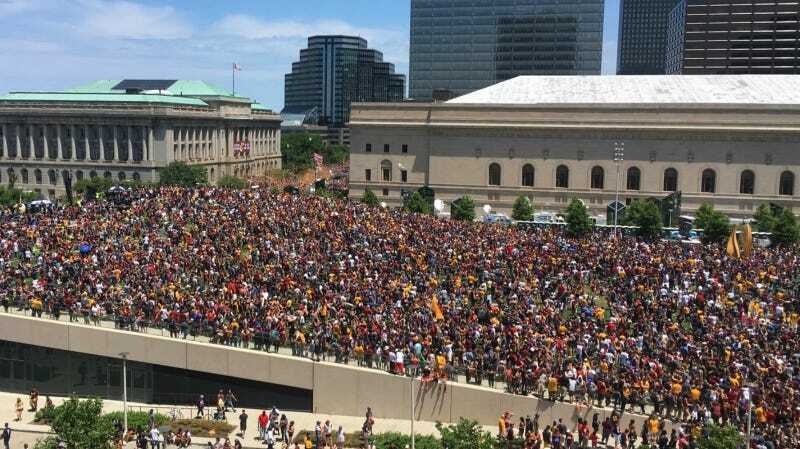 To demonstrate just how big it was, they used a picture of Clevelanders celebrating the Cavaliers’ NBA championship. Delightfully, the point of the Breitbart story seems to be that the press dishonestly downplays just how many people turn out for Trump. And while the Jacksonville rally was indeed massive (an estimated 16,000 people, according to a couple reporters who were there), it wasn’t massive exactly like that. UPDATE: A photograph that was incorrectly attributed on social media to the rally in Jacksonville has been removed. But anyhow, it was a nice try, and the orange-hued object of your affection surely appreciates it, guys.